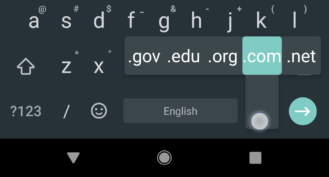 At the tail end of 2017, a teardown of the Gboard app provided clues that a new feature would automatically insert spaces after each punctuation. Now, with March coming to a close, that feature is going live with the v7.1 update. 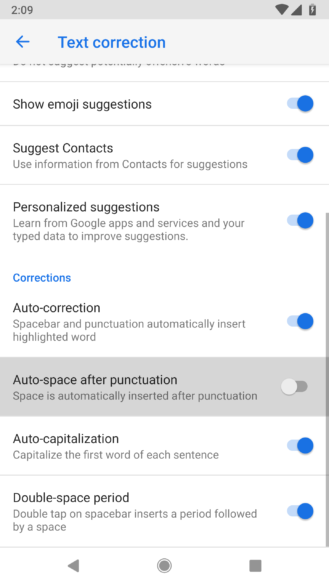 By default, auto-space after punctuation is disabled, but it can be turned on by opening the Gboard settings and finding the switch located in the Text correction page. 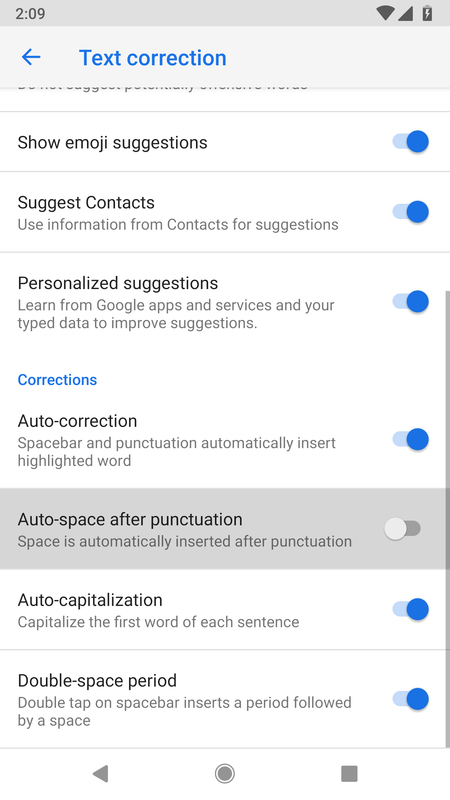 Auto-spacing is pretty simple; if you type a standard punctuation, Gboard will automatically add a space after it. This includes the comma, period, exclamation, question, colon, and semi-colon. If you happen to type a space after the punctuation, Gboard is smart enough to ignore the first one. Note: It seems to take a few hours for features to activate after installation of a Gboard update. If you don't have the auto-space option available when you check, try again in a few hours. It's also possible this is a staged rollout, but there's no clear evidence of that yet. Almost every Gboard update brings a set of new languages, and this one doesn't appear to be any different. This is a list of names extracted from the APK, but not all of them have been checked to ensure they're not already present or that they're available as of the latest update. These will be double-checked later today. Some people may not know about it, but you can long-press the period key to open a picker for choosing a TLD. The options have always been the same, regardless of settings and geography, but that might be changing. There are new strings that seem to suggest users in Korea, China, Hong Kong, and Taiwan will be seeing a new country-specific TLD included in the list. There's still work progressing on the Make A GIF feature. While it still doesn't appear to be live, there are a couple of interesting strings. The first is only really compelling because it's stacking an emoji in there to show people they're going to be recording something to make their GIFs. The other line also doesn't reveal much, but it does show the keyboard will need camera permissions, which means it's going to host the camera interface. There were also several other related lines, but nothing that presents any remotely new information. Now we're getting into the territory of experiments that don't come with enough information for any good guesses. The first up is Digit Mode. There are four lines that show it can be enabled or disabled, but that's about as much as these strings say. Another mystery feature is referred to as Pill UI. It's certainly a weirdly named feature, and may relate to either large or small changes. Truth is, there are a lot of extra on/off settings that may have assorted experiments behind them. I'll leave the list here, but there's not enough in the names to guess at most of these, and the few that do have meaningful names are promising changes that probably don't require much attention... But I'll leave them here for anybody that wants to skim through.